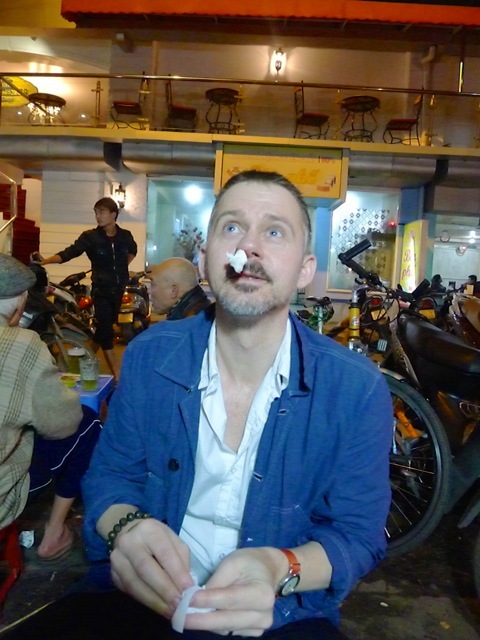 Vacationing in Hanoi recently, I learned that one way to understand the true nature a nation’s people is to shed your blood in front of them. 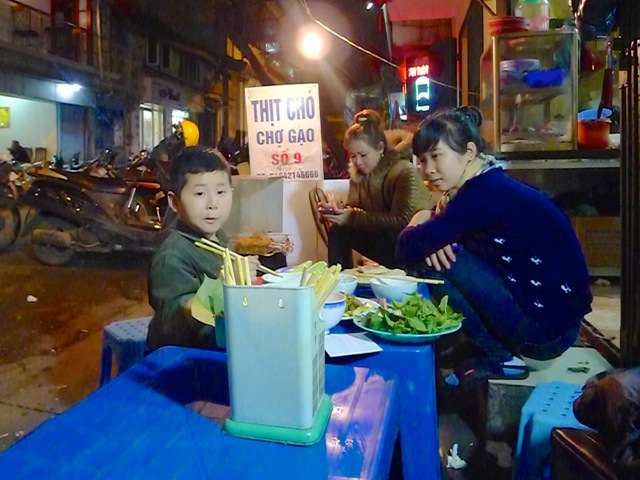 The plan had been to enjoy the bia hoi of Vietnam in whichever bar was full of the most locals. 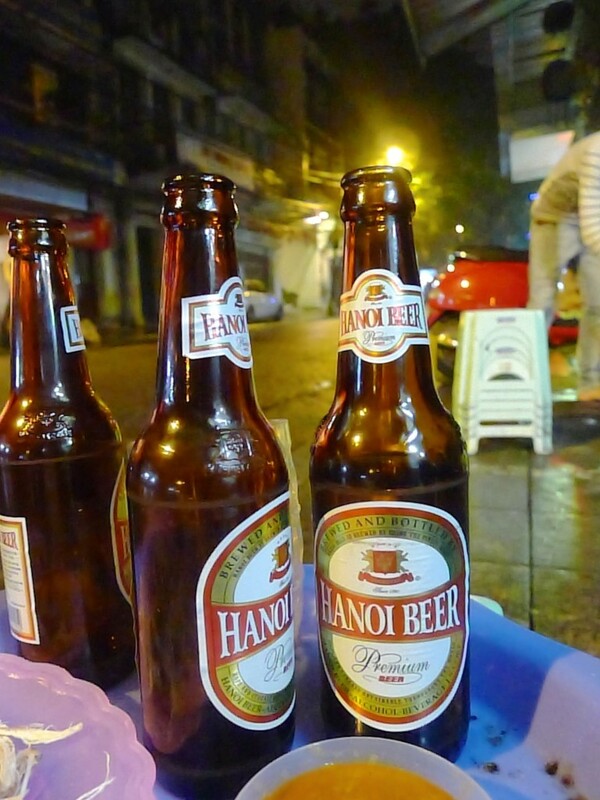 Bia hoi is a unique brew, ‘Fresh Beer’, a drink made without preservatives and delivered daily to the Hanoi bars that serve it. Moderately weak and very refreshing (or so I’m told, we’ll come to why I was thwarted), a small glass or nine seemed the perfect way to enjoy the end of a frenetic day exploring a city in which the sidewalks are so overrun with eateries and parked motorbikes that you have to mingle in the street with waves of traffic swimming around you somehow (terrifyingly, miraculously) like schools of dangerous fish. In the daytime, we staked out a popular joint and returned in the evening to enjoy our day’s-end reward. We sat down and ordered. The beers arrived in glass beakers with a little saucer of peanuts. (Vietnam has the most delicious peanuts on the planet, by the way.) And then I felt my nose beginning to run. Only then it continued to run. My splendid, almost-Neptuneque beard (what?) was soaked through on one side of its mustache. And then I noticed some red stuff beginning to drip down onto my fingers. Well, this was embarrassing, but I’d had plenty before. As a child, my nose had to be operated on to stem the almost daily flow. And even so, every now and then they return. The table had a few napkins and I started to mop. And then we ran out of napkins. Our amused waitress brought more. Attention was soon being paid to the bleeding tourist. (I use a modernized, more Anglo-Saxon version of the phrase “bleeding tourist” just about every day in New York.) The mood was good, the mime/sign language for “tip back your head” was Mexican-waving around the tables as if everyone was taking it in turn to knock back an imaginary shot. I laughed. My wife drank her bia hoi. More blood. My wife drank my bia hoi. And as red napkin followed red napkin, like a gruesome magician’s handkerchief trick, the mood began to change from jollity to moderate concern. I had packed many bright shirts for the sunshine of Vietnam. And yet, obviously ‘Nosebleed Night’ was the night I had chosen to wear the white one. Everyone looked relieved. The bleeding tourist had been taken care of. Back to the bia hois, boys. I considered starting on my own beer but I was a little woozy and very embarrassed and instead decided to take a few deep breaths and allow the bleeding to subside before I began drinking. Five minutes later I removed the plug from my nose. One Mississippi, two Mississippi, three Mississippi… nothing yet… perhaps the bleeding had finally… and then there fell from my nose a tumble of semi-clotted strings like half-set redcurrant jelly. Here we go again. Everyone’s attention returned to the bleeding tourist—men, women and children alike. As you can see here. It was at this point that a man who had slipped away from the table next to us returned. Wow! He had been to the pharmacy and bought cotton wool and something he was now pulling from a packet of what looked like wet wipes. The wet wipes turned out to be some sort of adhesive cold compress. How incredibly kind of him. I’ve been trying to imagine what would happen if you sat in a New York bar with blood spouting from your nostril. I’m not saying that you would be treated wholly unkindly but I think the bar might start to wonder — what if the health department show up? I think everyone around would show great concern and then you would be gently ushered out as quickly as possible. 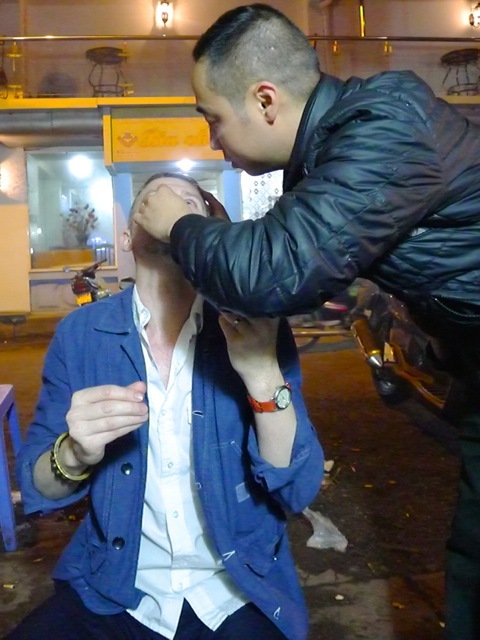 But here in Hanoi, where wages run at about a hundred dollars a month, a total stranger had left behind his beer to head off for the pharmacy in order to buy the bleeding tourist medical supplies. That being said, the cold compress was heavily mentholated and positioned an inch beneath my eyes. So yes, it was incredibly kind of him indeed. Although I was now streaming liquids from three locations. I kept the mentholated compress glued to my face for as long as I could bear, not wishing to seem ungrateful. I was now totally blinded by tears and still bleeding profusely. It was up to about forty minutes of gore and the mood in the bar was becoming more concerned. My supplier of local pharmaceuticals had vanished and returned yet again. He had pills. Unidentified drugs. My wife tried to ask him what they were. “Stop. Stop. Stop,” he said, pointing to my nose. And now it was time for another plug. Clearly this plugging business was no mere women’s work. This time the insertion required the arm-strength of a man. My local pharmaceuticals supplier left this task to someone more qualified. The curious child’s father. And then came another five or ten minute wait to see if the bleeding would stop. I removed the plug. Another red rope fell from my nose. The man at the table next to us disappeared once more. When he returned for the third time, he had more cotton wool but this time it was accompanied by a bottle of something. I looked inquisitively at the bottle. “Iodine!” he reassured me, as he started to pour several ounces of the brown liquid onto the cotton wool. It momentarily occurred to me that these very, very kind people might not be medical experts. And yet they were being so overwhelmingly kind, I thought it only fair to let them do whatever they want to me. Menthol in the eyes, sure. Unidentified pharmaceuticals? Load me up. The 53rd element on the periodic table? Ram it straight up there. Anyway, it would be a very English kind of death, dying from being too far too bashful to refuse the well-meaning-but-potentially-fatal kindness of strangers. As a nose-bleeding child, I had been to the hospital in my own country, a place in which I spoke the language and had to negotiate no insurance difficulties. They had stuck a soldering iron up my non-anesthetized nose. It hurt. A lot. Half an hour later my face started bleeding again, a record display that had lasted between two or three hours. I was NOT going to the hospital while abroad. 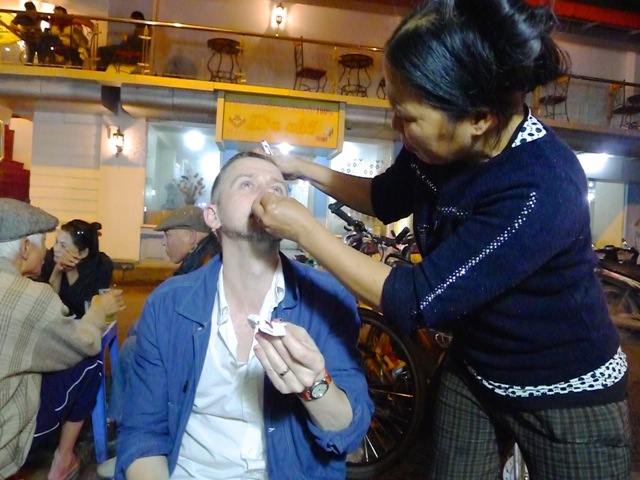 OK, so the bia hoi drinkers of Hanoi had not come up with the ingenious/ridiculous solution of inserting a tampon into the nose of a bleeding tourist. But they had done something much more important than that. They had shown what sort of people they are. Blood will tell.